In recent years there has been a large shift towards LED (Light Emitting Diode) lighting from the old technology type such as Halogen and Fluorescent lighting. LED lights, with their superior qualities such as low power consumption and high efficiency, very bright light, and long life span, very quickly became the first choice when it came to lighting. One of the first type of lights to adopt the new LED technology was the downlight. However, the first LED downlights were often large and bulky, had a very narrow beam angle, sometimes required special electronic drivers, were non-dimmable or worked with only a very small selection of dimmers and lastly were very expensive. This meant that for the average home, these LED downlights were not yet ready to provide the high quality of light, which has become the new standard. Fast forward several years and now we have LED downlights in a wide range of sizes, colours, wattages and light intensities all at prices to suit most budgets. While it might seem like we have reached the peak of LED downlight innovations, the Tradetec Quest LED downlight by Martec has proven otherwise with its smart design and innovative one of a kind dimming feature. Martec’s Tradetec Quest has a unique dimming feature that is favoured by many people and their electricians. Dimming option shave almost become a regular function for high quality lighting. This has been more prevalent recently with the increase usage of LED lights which are often very bright. Dimming has given many homes the possibility to regulate the light intensity as needed. In the past two types of lights would have to be installed, a main bright light for working or reading, and a softer background light to create a mood or atmosphere. The problem for some of the earlier LED downlights, is that they weren’t often compatible with many dimmers, if any at all. In some cases it became a guessing game as to which LED downlights would work with dimmers and how this would affect the lifespan of the light. Martec has solved this issue by removing the need for an external dimmer switch all together. The Tradetec Quest LED downlight comes complete with a built in step dimmer meaning no other dimming switch needs to be installed or used. How does it work?... Quite simply using your existing light switch.The secret behind this innovative dimmer in the Tradetec Quest is high techelectronics that can recognise when the light switch is turned on and off inquick successions and regulates the light intensity. This results in a 3 stepdimmer that works on your existing light switch giving you a high (100%),medium (50%) and low (15%) light intensity setting. The Tradetec Quest alwaysstarts on full brightness, but after a couple of quick flicks of the switch canbe brought down to a softer light. Not needing a dedicated dimmer switcheliminates a lot of the hassle that was once associated with regulating thelight intensity of LED downlights. Being a simpler setup also makes theinstallation easier for the electrician and therefore cheaper. Important note: The Tradetec Quest has a built in step dimmer as part of thedownlight itself and operates on a standard on/off light switch. 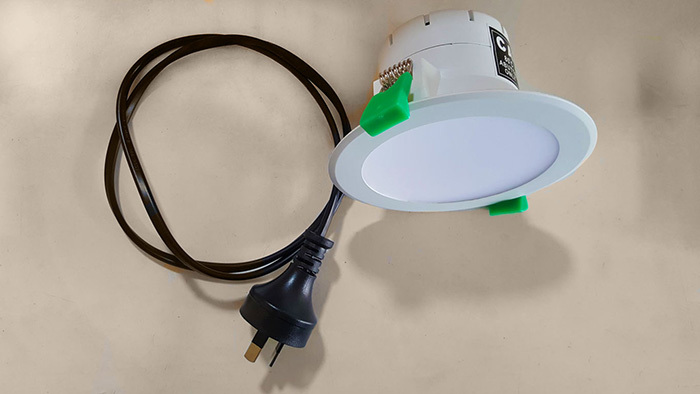 If a dimmerswitch is already installed it is recommended to disconnect the dimmer as thismay cause the LED downlight to flicker or not work properly. It is best toconsult and get the advice of a qualified electrician prior to the installationof light fittings. Whatmakes a good LED downlight? With so many different types and brands of LEDdownlights around, and more turning up every few months, it can often leave youfeeling that these lights might not last very long. While there are some LEDdownlights that can become obsolete merely a year after they are released andhave a short warranty period, the Tradetec Quest is backed by Martec’s 3 yearreplacement warranty (labour not covered). That way you can have a piece ofmind knowing you don’t have to start looking for new downlights any time soon.Furthermore, the Tradetec Quest utilises Martec’s high quality and long lastingLED technology, which is rated to last up to 50,000 hours of use. To put thatinto perspective, using the downlights for 5 hours a day, every day of the yearwould work out to over 25 years! Traditional halogen downlights typically had very narrow beams of light at 60° or less which meant that you have bright and dark spots across your room. One way to overcome that was to simply install more downlights in orderto try to get a better and more even light coverage. The Tradetec Quest LED downlights have a huge 100° spread of light. This wide beam angle ensures that you get a nice overlap of light from one downlight to another,even if they are not very close to each other. This wide spread not only provides a more even light, but also lights up the walls better lighting up theentire room. LED downlights use very little power, but produce a verybright light. Most LED downlights typically use less than 15 W, and while asmall difference in wattage might not seem like much, it can impact the amountof light the downlight produces. A good quality LED downlight that produces agood intense light should be at least 9W and ideally have at 700 lumens (themeasure of light output) or more. The Tradetec Quest uses 11 W and boasts animpressive 900-1000 lumens of light depending on the light colour temperature. The colour temperature of the light is also anotherimportant consideration, but is one that relies heavily on personal preference.Traditional halogen downlights have been usually available only in a warmcolour (2700 K - 3000 K), and most LED downlights are available in both a warmwhite (3000 K) and a cool white (5000 K). However the warm and the cool whitecolours are vastly different which often meant that a compromise had to bereached when selecting the most appropriate one for the type of room or setting.Martec has come up with a solution by making the Tradetec Quest available in a3rd colour temperature that is in between, the natural white (4000 K).The natural white is often the best choice when the other colour options are alittle too yellow or too white. This consideration is usually only important if you are planning on installing your LED downlights in an outdoor area or in the vicinity bathroom that might get a little steamy. It is important to make surethat any lights you install outdoor carry an appropriate outdoor rating, which usually comes in the form of IP Codes (International or Ingress Protection Marking). This rating is used to indicate what level of protection the fittinghas against particles or dust and water. The IP Code is written with two numbers, the first refers to particle or dust protection, and the second for water. The Tradetec Quest has an IP rating of IP44, this means that it is protected from solid particles down to 2.5 mm in size (solid particleprotection of 4). More importantly it is also protected from splashes of water(liquid ingress protection of 4), making the Tradetec Quest suitable for almost any outdoor (covered) setting. Important note: While the Tradetec Quest has an outdoor rating of IP44, it is recommended not to install the downlight in any location where it is going to be exposed to water or rain. I.e. not to install in exposed areas but rather undercover. Theaverage person in most cases does not need to be concerned with theinstallation of a downlight as these fittings need to be installed by aqualified electrician. However, it is often very beneficial to have downlightsthat are easy to install, as easy installation means a simpler job for theelectrician which usually results in the installation costs being cheaper. TheTradetec Quest comes assembled with the built in driver, and has a 2 pin plugmaking installation a whole lot simpler. Whenit comes to roof insulation, LED lights which run much cooler than Halogenlights, do not require special heat covers. The Tradetec Quest has a thermalinsulation class of CA 80° abutted only. This means that thedownlight can be closely abutted along the sides, but not covered by insulation(that can safely be exposed continuously to temperatures of 90°). Importantnote: All lightfittings must be installed by a licenced electrician. Never attempt to installor fix any lights yourself. It is best to get advice from a qualifiedelectrician about the installation of lights and how they can fit with yourinsulation. Almost as important as all the other points, the price of a downlight should also be considered. Initially there were not many cheap LED downlights, with some units consisting more than $100 each. Even at half this price, the costs very quickly add up when changing to LED downlights across a home. However as the LED technology became more common the price for these lights has come down to under $50. At Fans On Sale we believe that LED downlights should be availablefor anyone who wants good quality lights that are bright and cheap to run. Thatis why we are offering the Tradetec Quest at $32.67 each as part of a 30 unit complete bulkpack, or $39 each individually. If you have any questions about theTradetec Quest LED downlight, LED lights in general or require assistance inchoosing the right one, please feel free to contact us and our friendly staffwill be happy to help.